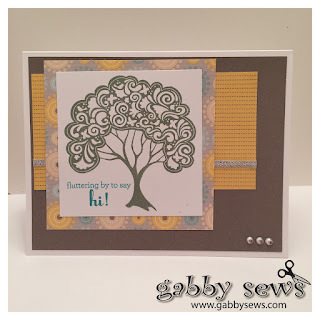 gabby sews: Women of Foundations Card Workshop - Fluttering By To Say Hi! Women of Foundations Card Workshop - Fluttering By To Say Hi! Here is the final card in the Women of Foundations Card Workshop for February 2016. This card is really fun and I think it can be sent for all sorts of occasions. This particular card will probably take the most time to put together but I think it's worth it! Slate Cardstock by Close To My Heart - 5.25" x 4"